Teofimo Lopez shined in a major step up bout as he dominated William Silva by scoring a 6th round stoppage in their lightweight bout that was the co-feature on ESPN. The bout took place on Saturday night at the Lakefront Arena in New Orleans. In round one, Lopez dumped Silva with a left hook. Silva was bleeding from the nose, In round five, Lopez landed several hard hooks to the bloodied Silva, and then dumped Silva to the canvas in the corner. Lopez came out in round six by landing three left hooks and a right that dropped Silva and the bout was called at 15 seconds. 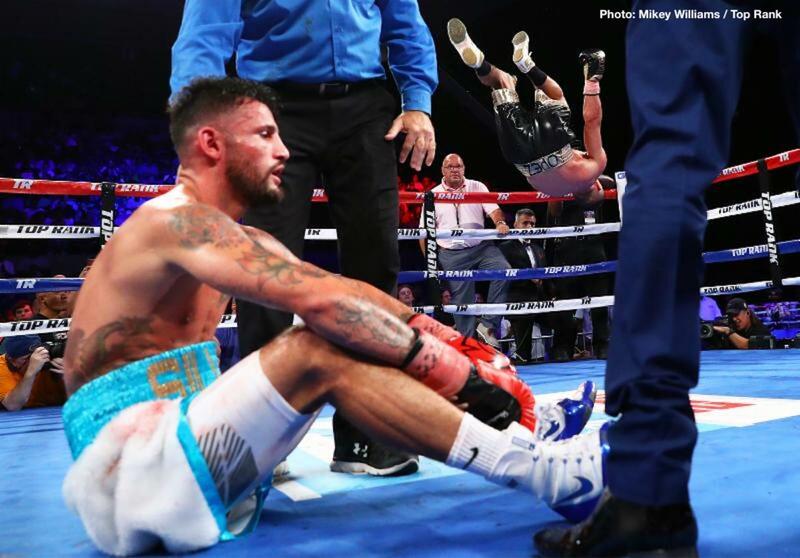 Silva who came in with a record of 25-1, and is only loss was to Felix Verdejo on HBO, had never been knocked down before the fighter known as “Gordo” dropped him three times. Lopez is now 10-0 with 8 knockouts. Silva is 25-2. “I can’t remember ever seeing such a dynamic young performer as Teofimo Lopez. He’s going to be the best in the world,” said Split-T Management CEO David McWater. World Ranked Junior Lightweight Erick De Leon showed the heart of a champion by fighting 9 1/2 rounds with an injured shoulder, but still won just about every round in his ten round unanimous decision over tough veteran, Adrian Young. The bout took place at The Lakefront Arena in New Orleans and was shown live on ESPN+. De Leon was knocked down in the 1st round with a left hook. De Leon dislocated his shoulder in that same round, and fought through his injury. De Leon fought well over the next nine rounds. De Leon boxed very well over the final nine rounds to get the victory by scores of 98-91 and 97-92 twice. De Leon was able to fight on despite the severity of the shoulder injury, which required hospitalization following the fight. De Leon of Detroit remains undefeated at 18-0-1. Young of Los Mochis, MEX falls to 25-5-2. “Erick dislocated his right shoulder when he fell in the 1st round. He got up and won nine straight rounds with only one arm. How can you not love a guy like that,” said David McWater, CEO of Split-T Management.